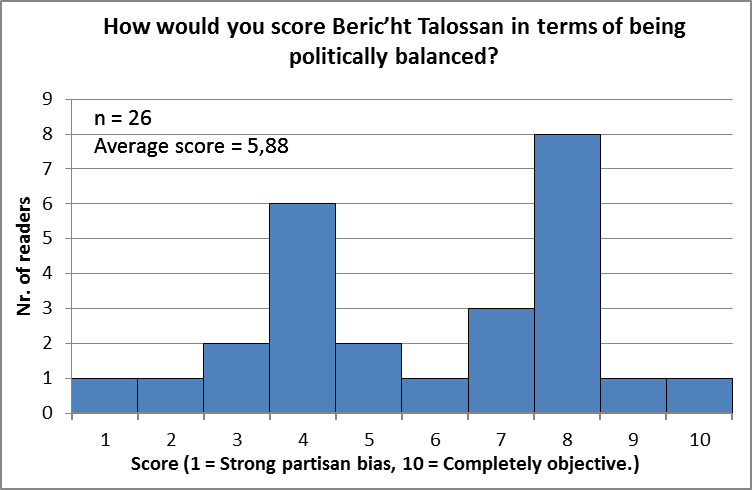 Beric’ht Talossan readers on average give Beric’ht a 5.88, on a scale of 1 to 10, when asked how politically balanced it is. 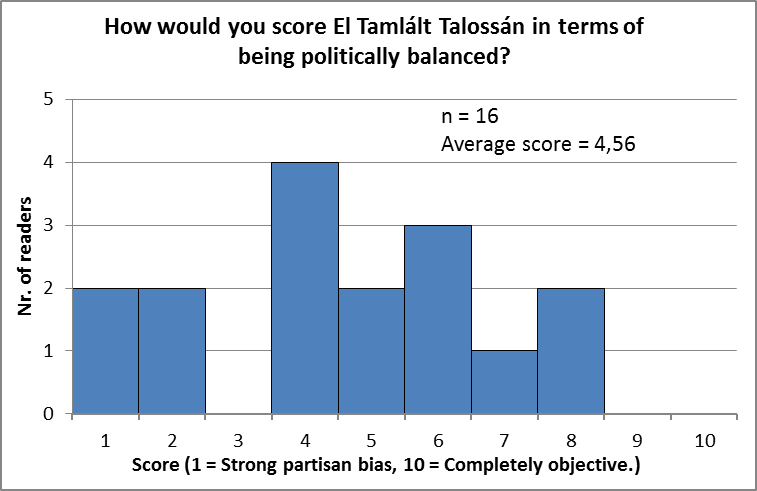 Reader of El Tamlalt Talossan are more critical of that newspaper, giving it a 4.56 on average. 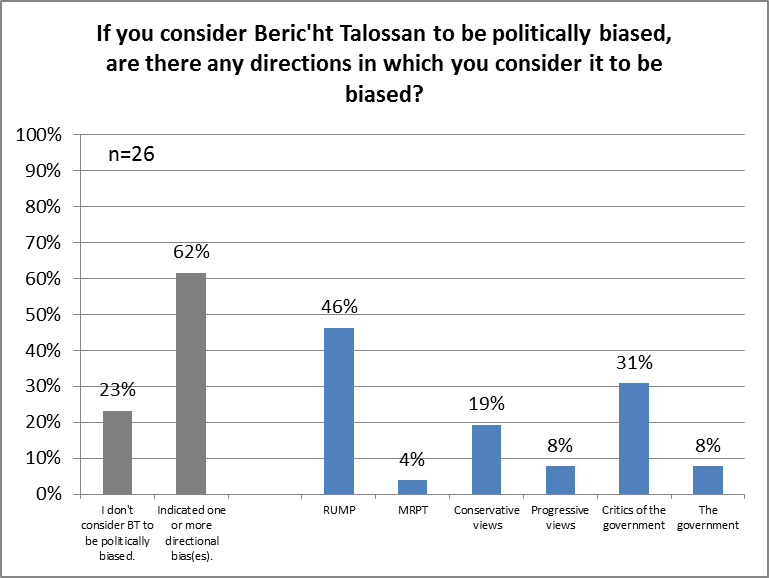 These were the results of a Beric’ht survey among active Talossans and Beric’ht subscribers. 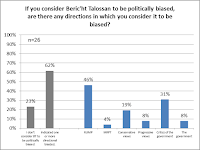 46% of Beric’ht readers say Beric’ht is biased towards the RUMP, while as much as 56% of ETT readers say ETT is biased towards the Free Democratic Alliance. 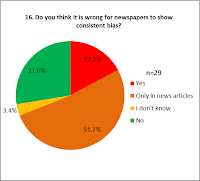 Though many seem to consider ETT, and -- to a lesser degree -- Beric’ht to be biased, this does not mean people do not trust the news, as the scores for both newspapers are much higher when asked about their trustworthiness, withBeric’ht getting on average a 7.44 and ETT a 6.69. 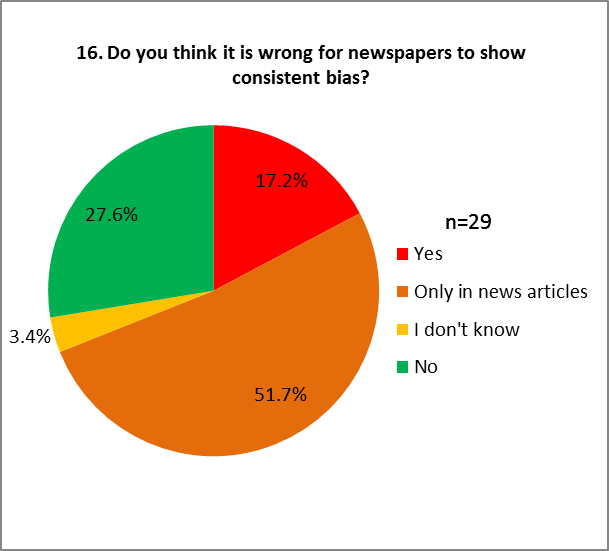 It also doesn’t mean it is necessarily seen as a bad thing, as when asked whether it’s wrong for newspapers to be biased, 52% of the respondents said it is only bad when it concerns news articles. Both S;reu Xheraltescú and Sir Alexandreu are leaders of political parties (RUMP and LibCon/FDA). 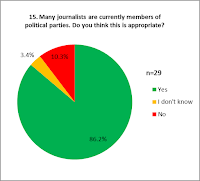 Likewise, many journalists, including the author this article (who is not only a member of the MRPT, but also reporting about his own survey concerning the same newspaper he is working for), are members of political parties. 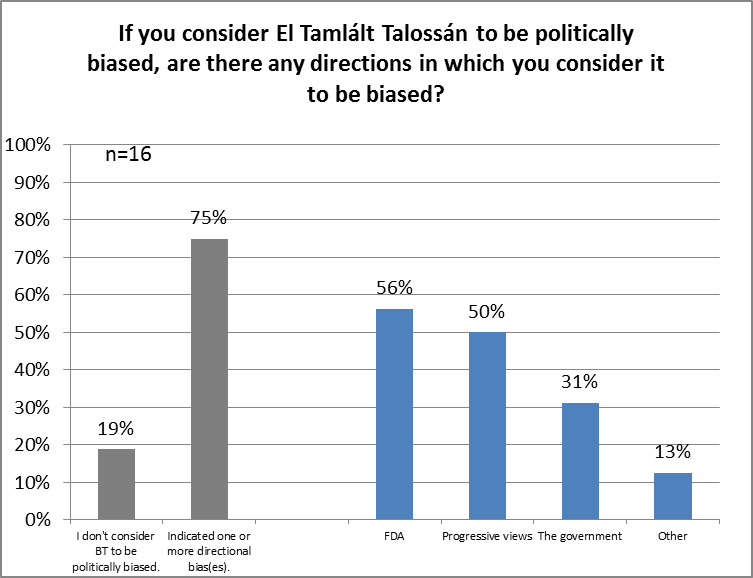 When asked about his position as editor and party leader, Sir Alexandreu stated that “It's not ideal, of course. But we have a small country, and that's why pretty much all the press has been run by people who are also very active politically, historically speaking.” Most people seem to understand this, as a majority of respondents to the survey think it is appropriate to be a member of a political party both for journalists and editors. 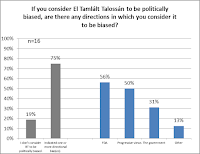 The anonymous cartoons that are published by both ETT and Beric’ht appear to be a divisive issue for Talossans. 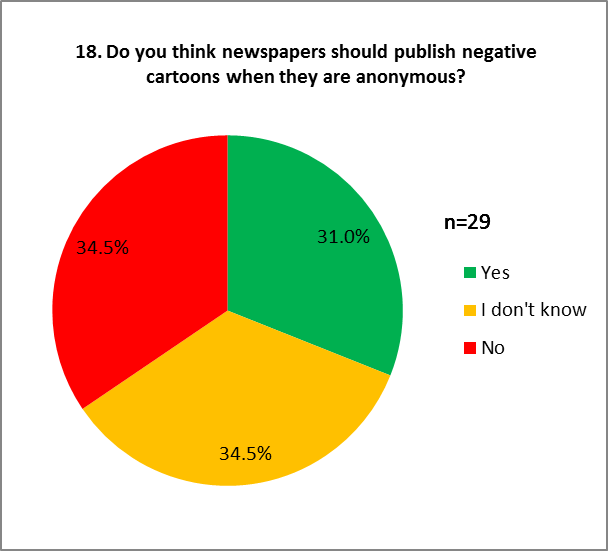 When asked whether newspapers should publish negative cartoons if they are anonymous, 34,5% of the respondents to the Beric’ht survey about bias in the media, said they shouldn’t be published, while 31% said they should, the remaining 34,5% being undecided. The cartoons themselves have been the subject of criticism quite often. The cartoons in Beric’ht often target members of the government, particularly Senator Schivâ , who has criticized some cartoons as being abusive. The cartoons have been cited by her as the reason not to give interviews to Beric’ht anymore. ETT owner Carlüs Xheraltescú also believes anonymous cartoons should be able to get published; “There's a fine line though and nobody should be immune from criticism - cartoonists included.” ETT cartoonist Greg Glodaral has posted some controversial cartoons, including one that used private facebook photos from the facebook page of the wife of the Beric’ht editor. The cartoon was removed, but there were no further consequences for Glodaral. The photos were not the only recent cartoon controversy, as Beric’ht cartoonist ESM posted a cartoon which he claims was created in a cartoon exchange with Glodaral. However, Glodaral denies having anything to do with this. Sir Alexandreu has announced to be investigating the matter. When interviewed this week, he did not have any comments, but the latest news is that he has released a statement that Beric’ht will stop publishing his work.